- Pull requests for changes are all right. You could also use "git push" terminal command to push commits directly into the git project. - We have no specific idea how the welcome-screen icon should look like. Since it's not a strong priority right now, we can leave some time for an idea if it comes in itself. - A really difficult decision Maybe the left one with overlapping Q tail. Both looks fine and makes a specific feeling, would you have some preference ? - Symlinking wouldn't make much sense. You could pick some more frequently used icons for example "konqueror.svg" to create variants. The most required one is "software-store.svg" for now. The lowest priority have the TDE powersave icons. In any case, this task is not critical, not even highly important, it can be proceeded step by step, and occasionally from time to time. I started working on some of the size variants (software-store, konqueror, and tdenetworkmanager). I'll keep plugging away at the others and upload them as I go. As for the menu icon, I made a hybrid of the two by cleaning up where the top left of the rectangle stuck out past the quarter circle. I think it makes a nice compromise. If you're good with it, I will upload the svg file to Github (or just replace the -m1 file). That's great. Please replace the -m1 file to keep the standard Q4OS distributor logos untouched. Size variants for this one would be appreciated. File replaced and all size variants have been uploaded. The 16x16 "distributor-logo-q4os-m1.svg" have different, a bit thicker, border then "distributor-logo-q4os1.svg". Please make the 16x16 border thinner, and unified across all icons. Size variants border need to be the same for any of icons to keep the look unified. The "16x16" should have tiny or no border at all. Smaller size icons should keep proportionally thinner border in comparison to larger sizes, the same way as "xorg.svg" example, discussed previously in this thread. All in all, the logos look great, thanks for that. See a specification of the icon border, that should be identical for all icons of one size, for ex. 24x24. 16x16 icons should have no border, or very tiny one. 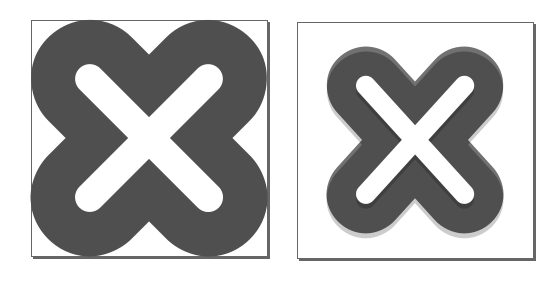 Larger icons should have proportionally thicker border, see for example the "xorg.svg" 16x16 versus 48x48. Images below are resized and normalized for clarity. So, thanks to your visual, I had my Homer Simpson "Doh!" moment. You say border where I would refer to that as whitespace, but now I'm clear on what it is you're looking for. You probably thought I was crazy with the changes I had made before! I'll go back and review/rework the various icons with the new understanding in mind. I've uploaded size variants for the app icons that didn't have them. I also added a couple new ones. The first is a disabled version of tdenetworkmanager because I noticed it was present in other icon themes. 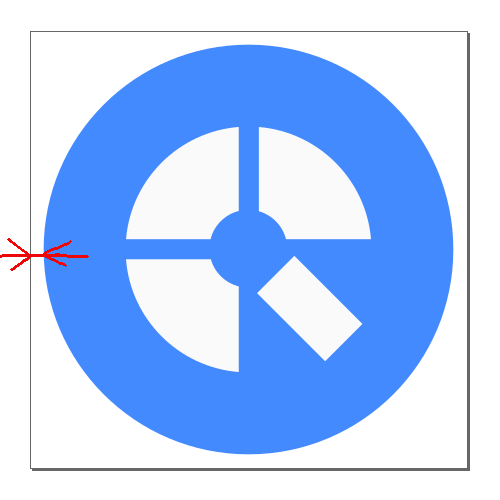 The second is an icon for TDE Components in the Control Panel. I'll start resizing all 19 of the power manager icons so that those will be done as well unless you have any other immediate requests. Really impressed with this icon set - it's obviously a labour of love! You probably know this anyway, but there is a bit of a disconnect in the 16x16 Places icons. As you can see from the screenshot, the relevant icons for Downloads, Pictures and Music are not the same style as the larger sizes of the same name. The places icons are derived from the original Paper icon set, a couple of small 16x16 icons intentionally differ for better pungency. Anyway, there are still some inconsistencies in the icon set, we would like to polish that as much as possible. Out of curiosity, which type of 16x16 or symbolic icons are preferred? Those that are colorful and fairly similar to the larger variations, or icons that are simpler and either monochome or two-color? Or is the current mix fine as it is? After I'm done adapting the power manager icons to the full range of sizes, I could start looking at the 16x16 icons throughout the theme to tweak some of those if there was value in doing so. Probably the easiest answer is if you have a look at the screenshot I provided above, it's the icons showing for Downloads, Music and Pictures that are out of step with the main icon set. Would you specify some example of "symbolic icons" please ? In general, the "colorful and fairly similar to the larger variations" icons would be preferred. By the way, did you figure out some idea about designing a new welcome screen icon ? Just a question, it's still no priority. An example of the type of symbolic icons I was referencing is the xorg.svg icon you had shown above. It's basically a single color (two, if you cound the white in the middl;e) and simple with no shadows or excessive detail. Rather like the system tray icons you see in something like Gnome. As for the welcome screen icon, I'm still puzzling out what type of pictogram says "welcome". Is it a modified distro icon (which is what Ubuntu Mate and Manjaro use)? Is it some sort of "help" style icon? Is it a smile? It's hard to demonstrate a hand waving hello in an icon, and depending on someones culture, this may not even make sense. The welcome screen is one of the first things new users see upon booting into their new installation so you want the icon to be good. I'm just sort of stumped. ... I believe what @bin was commenting on was not the style per se but that there was an inconsistency between the displayed icon versus the actual folder icon. The music folder is gray with the white music notes but the tree icon on the left of his image was showing a round colorful icon. Yes, 16 icons differ from other sizes for Downloads, Pictures and Music. These particular icons are shown very frequently in open/save dialogs, they should be distinguishable as best as possible, primarily for small sizes. We believe, it's Paper icons developer's intention to differ these specific and frequently used icons in small sizes. Strangely, I don't see this behavior in either Konqueror or Dolphin on TDE; I see a plain gray folder icon on the left in the file manager. It's most likely a sort of bug. We will try to reproduce and investigate that and post here as a new info available. Really, the welcome screen icon should be as good as possible. If anybody would have some general preference how it should look in Q4OS, please state it here. We would prefer some sort of modified distro icon, but accept any other thoughts. Again, it's not urgent task, so we can let a time for an idea to develop slowly. It would be nice to have symbolic icons unified, for example for the system tray, but it would require consequential modifications of TDE code and libraries. So, for the time being, we would prefer current mix as is, and focus on another easier tasks, and polishing the theme. Since the menu and distributor icons are round, I did a draft of a welcome icon using a rounded square in a few different colors. Suggestions or other input is certainly welcome. On the standard install the .directory files are not present in Downloads, Pictures and Music. If one introduces .directory files to correct that in the main folder view the result is as shown in my screengrab. It's compounded by the fact that CrystalSVG does not have folder icons purposed specifically for some folders and that the naming conventions do not seem to be followed 100% by all icon themes. So, switching between icon themes becomes a bit fraught. Would a simple solution be the creation of symlinks in Paper to point to the correct 16x16 version of the larger folder icon?? The rounded square shape looks like a right step. What about to make a thin colored frame and Q4 logo filled by the same color, on the white, or some other, background ? The color(s) can be changed. This is just a draft using your suggestion. I uploaded all of the size variants for the power manager icons. That's great, we will check the new icons and possibly include them into the next update batch. The welcome logo looks fine, what do you personally mean about the style ? Anyone else opinions ? Now, we would focus on the polishing the Debonaire theme for Trinity as well as for Plasma. You could go through the theme and suggest what to improve, as time permits. Would anyone ask some specific requests regarding the Debonaire theme ? The welcome icon doesn't need to be two shades of the same color or even orange at all. I'm open to suggestion or I can upload some other combinations for a vote. I'm also good with it as is if you like it. Whenever it's finalized, I'll upload all the sizes to Github. Incidentally, the look switcher still defaults to the Debian logo for the start menu rather then the newer Q4 logo (the -m variant) even though the latter is included in the icon theme. Naming convention perhaps? I tried something a little different with this third draft by incorporating the full color logo on a white background with the shade of blue that is used for the default installation background. I went with a thicker boarder because anything smaller tended to get lost at the size displayed on the task bar. Here's a screenshot showing the icon in Inkscape with the welcome screen open so that you can see the icon in the task bar as well.